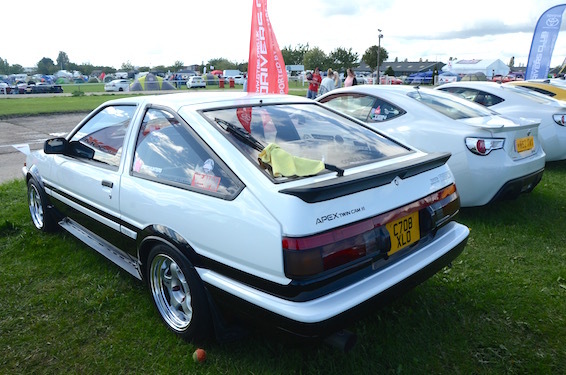 Heavy September clouds did nothing to dampen the enthusiasm of Japanese car owners from around the UK, as they descended on Newark Showground last week for Japanese Auto Extravaganza 2015. We joined the GT86 / BRZ Drivers’ Club on their camping pitch and stand with our Ove Andersson rally tribute GT86. 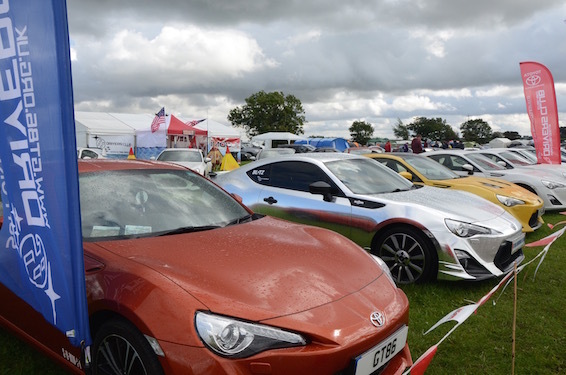 Every GT86 on the stand was slightly different to the next – a chrome TRD stood out along with club director Lauren Blighton’s white AE86 and her ‘matching’ GT86. 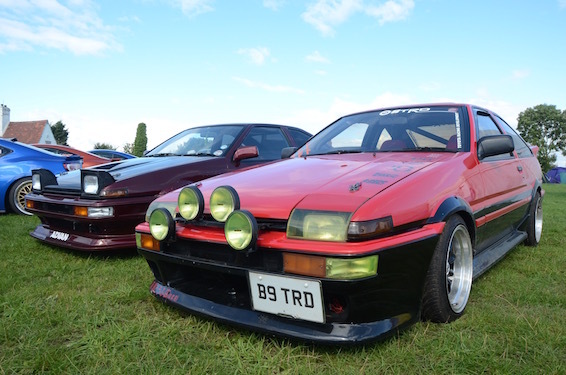 The show attracted several AE86 – a treat to have them all in one location, including Levin and Trueno models, each modified to reflect it’s owner’s taste. These two beautiful examples joined the GT86 stand and served to remind visitors of Toyota’s recent heritage. As well as Eighties icons, the Nineties were also well represented with the rare sight of four Toyota Sera in a row. These, along with the GT86, are proof that sometimes concept cars don’t change all that much when it comes to production. We loved the well-kept condition of the interiors as well as the carefully selected Yaris T Sport alloy wheels on the grey metallic car. 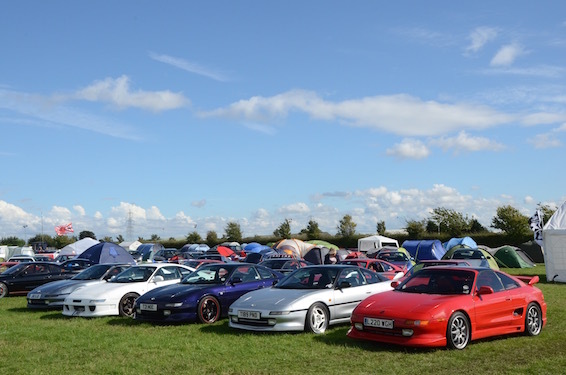 The MR2 Owners’ Club had a large pitch to allow for their many cars and tents. 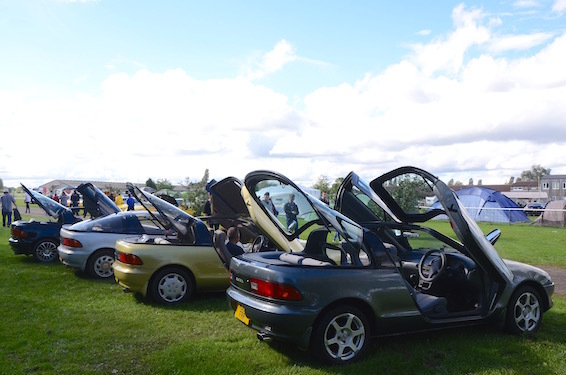 With the weather so changeable, devoted owners of all makes and models spent much of the day having to open and close cabriolet and targa roofs as well as drying off their cars repeatedly to maintain their proud show and shine standards. See more from JAE 2015 in our full gallery below. We enjoyed spotting so many rare and cherished Toyotas – perhaps yours is featured? Let us know your personal JAE 2015 highlights in the comments section or on Twitter at @ToyotaGB. 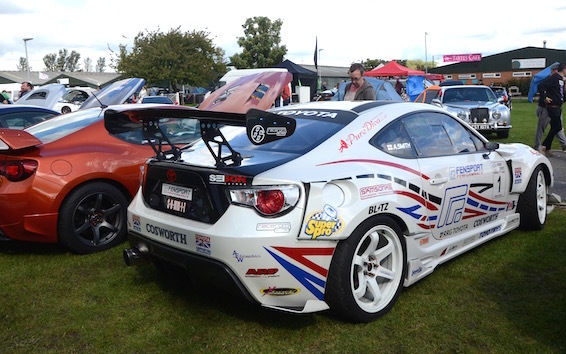 Find out more about our fleet of modified GT86 show cars. If you liked this, you may also wish to explore the GT86 website. So no mention of the JOINT International MR2 Owners Club/GT86 BRZ DC stand? The German members who drove in their MR2 all the way from Berlin and Duderstadt to be at the show? The rare TRD #1 on show on the stand? The members of both clubs that made the show the success it was? Thanks for your post and we are really sorry that we did not get a pic of the MR2’s from Germany. Thanks for letting us know about this. The plan was to have three representatives at the show covering the event for our Blog however due to unforeseen circumstances, only one of our team could attend. With a show the size of JAE this meant we would not have obtained all the images we would have liked. We will certainly bear this in mind for the future and will keep an extra eye out for cars travelling from Europe that attend UK shows. Also, please feel free to let us know about any events you are planning in the future. Thanks again for your post and hope you enjoyed the show. Thanks for the reply Charlotte…the post was more aimed to the fact that it was a JOINT stand with the International MR2 Owners Club & the GT86/BRZ DC. 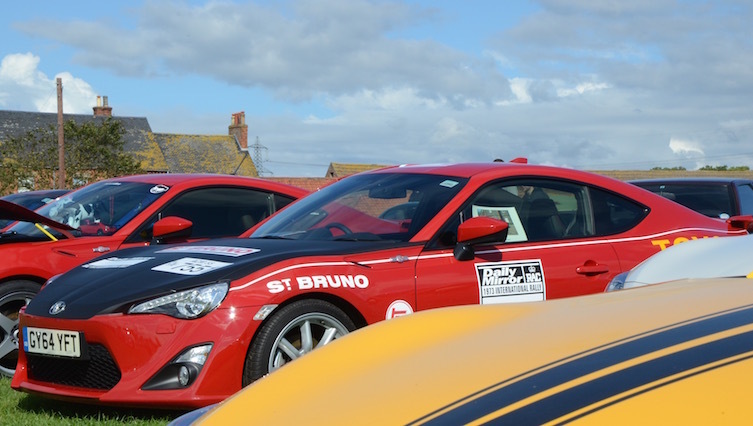 Yet in the blog it states you were hosted by only the GT86/BRZ DC….it may sound a bit pedantic but we paid equal share in the club stand and felt as though we should have been mentioned, after all the MR2 owners of IMOC hosted your representative too. Thank you for your reply. We should have picked up on this so thanks again for letting us know. Great to hear about your joint stand and feel free to keep us posted about any future events.